Why are business cards important for your business? In the digital fast paced world we live you might think that the humble business card is not important anymore. 5 advantages of having professional business cards. Business cards can set the standard for your business within a split second. Quality professional business cards show the recipients that you value their business. If you give them, a thin dog-eared version what sort of message are you communicating about how you do business? If you scrimp on such a cheap but important marketing tool, what is the rest of your business going to be like? Handing over you business card is quick, no need to fumble with the contact setting on your phone and you can be sure that the other person has all your details and they are correct. How often have you had to follow up because you didn’t get an expected email only to find they had your email address wrong? From the very beginning, humans have always been tactile; we crave touch. Ever noticed how someone feels your business card when you give it to them, then run their fingers over it, flip it, play with it. You can’t do that will with a digital contact and guess which one gets forgotten first. Business cards can double as an appointment card or a sorry I missed you card, a remember this card, a referral card or just a quick note. Business cards have a huge amount of uses. By adding your services on your business cards, your customers and prospects can see the other areas in business that you can help them with. You might be speaking about one area of your business and the customer doesn’t realise you do other services to until they read your card. 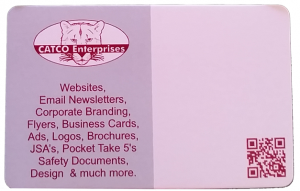 For instance, we are talking about business cards , did you know CATCO Enterprises also do email marketing and build brilliant websites? The bottom line is business cards are important for your business because you control the message that you give out. Whether it is to a prospect, customer or for a referral; your business card gives the message you want to convey. Such a small, inexpensive piece of your marketing can make a huge difference to people because of that fact that we all “Judge a book by its cover “ and first impressions count. Not happy with the message you business card conveys? 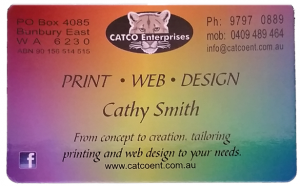 If you need a revamp or more business cards, give CATCO Enterprises a call on 9797 0889.